SAVE THE DATE for the 2019 fair: July 24-28, 2019! 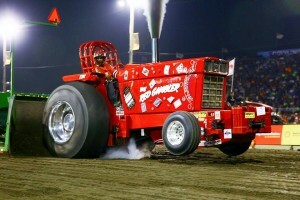 Tractor Pulling is known as “the world’s heaviest motorsport.” The goal of tractor pulling is to determine the strongest machine and the best driver. Different to every other motorsport in the world, it is not about the speed, but distance pulled. The pulling track is a minimum of 30 feet wide by 320 feet long. Tractor pulling is a competitive motor sport in which modified farm tractors, modified tractors or trucks drag a metal sled along a prescribed course. The sled contains a box filled with weight that is mechanically winched forward as the sled progresses along the course. Pulling this ever-increasing load eventually causes the vehicle to lose forward momentum and torque, although a rare few might indeed reach the end of the course, known as a “full pull.” The distance from start to finish is measured in thousandths of an inch and the tractor that pulls the sled the farthest distance is declared the winner. If more than one competitor reaches the full pull mark, a pull-off is held to determine a winner. Competition-level tractors might look like standard-issue farm equipment, but the similarities stop at the basic body and tires. 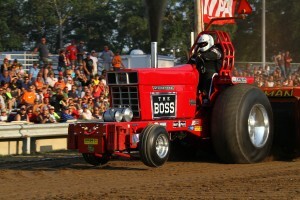 Tractor pulling is a sport based on horsepower and torque, which means that the engine must be modified to generate as much power as possible. 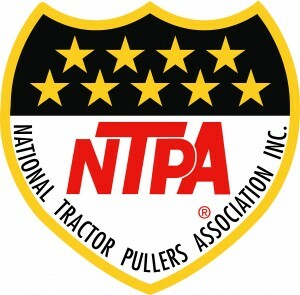 Various classes have been developed for tractors based on limitations in the rules. Modified tractor limits are based mostly on weight. Engines include drag racing automotive type, jet turbines, aircraft and industrial engines in various configurations. 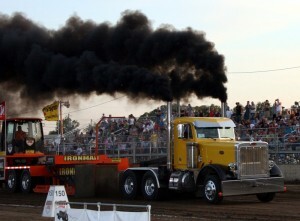 Trucks come in two wheel drive, four wheel drive (naturally aspirated, blown, diesel) and semis. S. M Henteges & Sons Inc.
Want to sponsor the fair? Friday Free parking for seniors over 65 and Veterans (until 4 pm). – No personal golf carts allowed on the grounds. – No pets allowed on grounds (with exception of service animals). That’s our Ozzy. She should be delivering anytime now. Michelle Isaacson Is that you on the far right? Who is driving the tractor? Find the required entry forms here. Interested in volunteering at the Scott County Fair? © 2019 Copyright Scott County Fair.